This is the second in my series at applying Jobs-to-be-done (JTBD) techniques to Recruiting. To recap, our open job position is hired by applicants (gets a job done in their lives) and has hiring criteria that the applicant applies when making decisions about it. 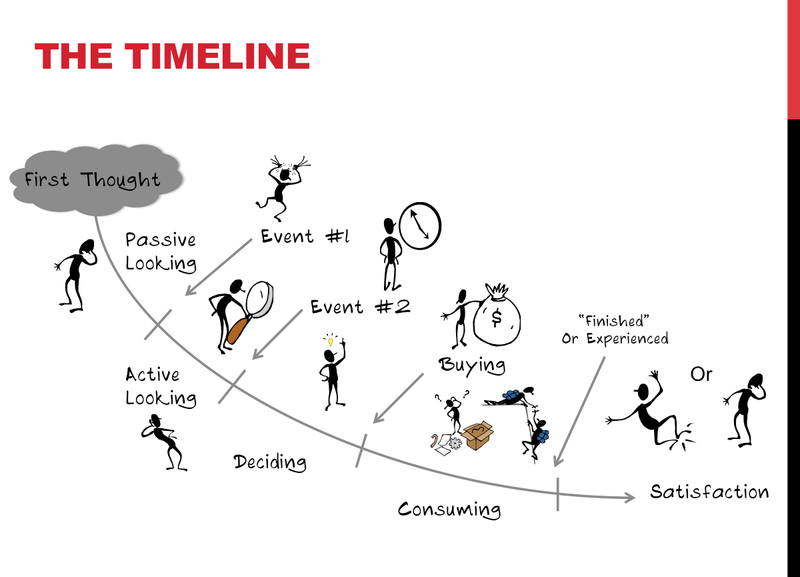 In their JTBD training, Bob Moesta and Chris Spiek teach how to interview to understand the JTBD Timeline (here’s a great description of the JTBD Timeline from Ross Belmont and here’s Bob and Chris’s JTBD Timeline Diagram). In this post I want to concentrate on the beginning of the timeline — the part where someone has the first thought that they might switch and up until active looking. From a recruiting perspective, the problem is that the people I consider to be in the top 1 percent in my field barely ever apply for jobs at all. That’s because they already have jobs. Stimulating jobs. Jobs where their employers pay them lots of money and do whatever it takes to keep them happy. If these pros switch jobs, chances are the offer came through networking, not because they submitted a resumé somewhere or trolled a job site like Monster. Many of the best developers I know took a summer internship on a whim and then stayed on. They have applied for only one or two jobs in their lives. If you want to run a world class development team you need to internalize this. What would you do to your recruiting efforts if you wanted to hire people that aren’t looking for a job? Tweeting, Updating Linked-in statuses, etc. It’s fine to do these things — there are actually active job-seekers. But, if you look at typical recruiting, this pretty much sums up the entire effort. Also, targeting the passive lookers is a long-game. If you need someone right now, then traditional recruiting is your best bet. But, in the long run, if you know you need a steady stream of applicants to succeed, you have to have a plan to target passive lookers. I send a personalized letter to every promising computer science major that I can find. Last year I sent 300 letters to fill six intern positions. Not e-mail. My letters are printed on a real piece of Fog Creek letterhead, which I sign myself in actual ink. Apparently this is rare enough that it gets kids’ attention. Matasano Security is “always hiring security consultants. Really.” In order to help build a pipeline of passive developers who know they exist and what they do (and that they are hiring), they have a “Crypto Challenge” email campaign. When you sign up, they email you list of crypto coding puzzles. They don’t recruit through this e-mail, but if know Matasano at all, you know that they are always hiring. I work in developer tools, so I know that our marketing department is always talking to developers (hey, we’re hiring a Developer Evangelist to help us do that even better). If you market to developers, you should have a plan for making sure they know how great it would be to work for you. If you don’t, but you need to hire a lot of developers, adding an SDK product to your line-up is not a bad idea (it’s probably a good idea anyway — the software business is all about platform proliferation). You absolutely need to have a functioning referral program — almost everybody has something, but if you aren’t getting a significant number of leads this way, you need to be having a tough conversation with your developers about why they wouldn’t recommend that others work with them. The answer is NOT that the referral program doesn’t pay enough, but you could probably make it work if you overpay. I believe that #4 is your indicator that you have solved the JTBD for recruiting (which is that the product is right — your developers love their job and would recommend that others with them). Look at the end of the timeline I linked at the beginning of this post — it ends with satisfaction (or not), and the point of that is repeat business and word-of-mouth. This entry was posted in JTBD, Software Jobs on 2013-Aug-16 by loufranco.